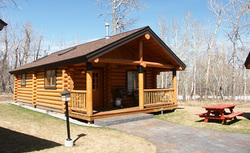 Beartooth Hideaway Cabins offer beautiful lodging for a wonderful vacation! All four cabins have a king bed in separate bedroom, hide-a-bed couch in sitting room, gas fireplace, kitchenette (no oven) with microwave, fridge, furnished cooking and eating items, gas barbeque grill on outside deck with patio seating, housekeeping services and use of the Super 8 large swimming pool, indoor/outdoor hot tubs and continental breakfast. Call 800-813-8335 for reservations. Directions: Beartooth Hideaway Cabins are located next to the Super 8 Motel in Red Lodge.